Our two collies (28 months and 5 months old) do not receive grain-containing dry food (Taste of the Wild salmon instead) on the advice of their breeders, so we also have been looking for a pure non-grain treat as well. 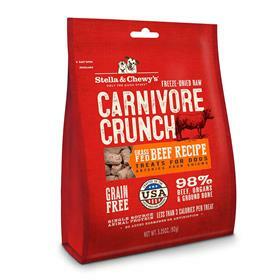 Stella and Chewy's may be crumpled up on top of their dry food or given whole in training them. The bag's zip closure actually works, so we can keep the treats fresh. The reason I put a '4' is because I need to make a careful check into comparative pricing. But the quality is good and consistent and our dogs love the treats. We need a tasty treat to bring them in from the outside readily at night, too, and to have them go voluntarily into their crates. The beagles go ape over the Beef treats and do anything I ask to be awarded one! Carry them in your pocket and they behave. One time, the young beagle got out and high-tailed it down the street when we were on vacation and all I had to do was yell "treat" and that puppy put on the brakes and came hurtling back to me! I will never be with out Stella and Chewys! I have a very picky eater. I've had to send treats that he won't eat to my Mother-in-law. He LOVES these and I feel good that I'm giving him something that is nutritous and doesn't have all those nasty preservatives.